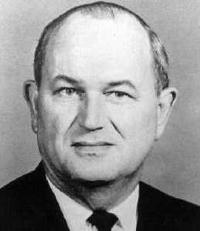 John Kenneth Craver was born in Jonesboro, Illinois, received his B.Ed. in Chemistry and English from Southern Illinois Normal University in 1937, and received his M.S. in Chemistry from Syracuse University in 1938. Immediately, he joined the Monsanto Chemical Company where he specialized in plastics, plasticizers and catalytic hydrogenations. He retired from Monsanto in 1979 after a very successful forty years. Among Mr. Craver's achievements are his invention of an unusual plasticizer, an alkyl diaryl phosphate, which became the standard aircraft hydraulic fluid. This fluid, which Monsanto called Skydrol, dominates the market for all U.S passenger commercial aircraft. Along these lines, he also developed a series of industrial non-flammable hydraulic fluids, called Pydrauls, for use in die castings, furnace door operations, underground coal machinery, and similar applications. Among his many professional activities, Ken Craver was involved in and chaired many committees of the American Chemical Society, the American Association for the Advancement of Science, and, towards the end of his career, founded and chaired activities involved in corporate long range forecasting called "Futures Research". During all these activities he had the distinction of being one of the very few people to chair two Gordon Research Conferences in the same year, 1966. He remained professionally active after his retirement from Monsanto. As part of Craver & Craver, Inc., he formed Futuresearch, continued to manage the Corporate Planners Round Table from 1975 to 1983 and served clients in planning and decision making, largely using his system of cross-impact analysis. He also continued to serve on the Board of the Institute for the Future until he resigned in the early 1990's after 25 years in that position. In 1987 he founded and managed Polytech Laboratories in St. Louis as a complement to Chemir Laboratories. J. Kenneth Craver authored many scientific papers, several books and was the holder of numerous patents.